A few years ago when I was on assignment in West Suburbs, I had made Oak Park, Illinois, a stopping ground for dinner on Friday evenings. Traffic was always aggravating and driving a manual shift car never made matters any better. 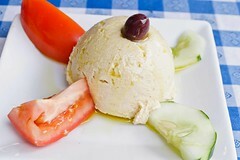 Oak Park has a nice selection of ethnic restaurants and one that I had not tried was Papaspiros Greek Taverna at 733 Lake Street. It was an outstanding dining experience and by the time I had decided to return for a repeat excursion, the restaurant had closed. Well, it has since reopened in a new location across the street at 728 Lake Street. With it being a perfect Saturday afternoon, I had an outdoor seat and prepared myself to savour some Greek dishes. I started with hummus. These creamed chickpeas, served with slices of tomato and cucumber and accented with olive oil, were quite nice and delectable. 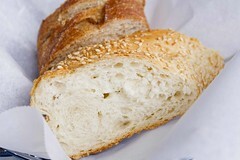 There was no pita served along with the hummus, so I used the complimentary sesame seed bread instead. That was fine until I was running out. I had ordered saganaki and good saganaki can have a spreadable consistency. The saganaki was also tasty. And usually, saganaki is set aflame at the table and then doused with lemon juice. 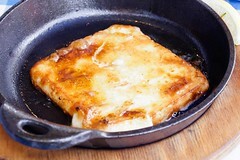 The saganaki simply came to the table already bubbling in the small skillet. Slowly I am starting to work myself back into my pescatarian diet. Blogging has a tendency for me to have chicken every once in a while and an occasional slice of beef. However, having had an appetizing seafood entree at another Greek restaurant recently, I thought that it would be a good idea to sample some seafood options from Papaspiros. 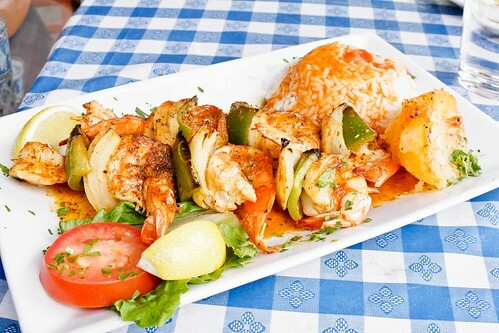 The shrimp souvlaki was a perfect choice. Plump shrimp marinated in herbs and skewered with onions and bell peppers, each bite was worthy of a want to return. The garden salad and rice pilaf that came covered in a red tomato sauce along with halved potatoes were quite a lip-smacking accompaniments. 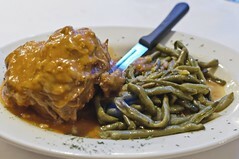 During my visit to Papaspiros at its former location, the first entrée I indulged was arni kokkinist — tender braised lamb, flavoured with fresh herbs, spices, and white wine, and served with green beans in light tomato sauce. Being a pescatarian at the time, eating lamb was a stretch, but it was not going to cause immediate ruin. With lamb meat falling off the bone and exploding with great taste along with fantastically seasoned green beans, the arni kokkinist deserved an encore. For the second round, I had sea bass with rice pilaf and steamed mixed vegetables of potatoes, carrots, zucchini, and cabbage. I ordered the sea bass complete with bones and with the head intact and t I took my time savouring each bite. Well, I should put that in context. I took my time so that I was not swallowing the small bones in the fish. The rice pilaf and the mixed vegetables were perfect companions to the dish and my server smiles wider every time she passed by and saw me nodding my head in appreciation for the offerings that she had suggested. After sitting for awhile, I was ready for a third entrée. I had Grecian riganati chicken. Oven roasted chicken marinated with olive oil, lemon sauce, and oregano, and served with rice pilaf was a perfect wrap-up entrée. The server had told me in advance that it would take half an hour for the preparation and it had come to the table in perfect timing. Each bite was succulent. The meat was moist and I kept working my knife and fork slowly until I could not finish all of it. The server was rather impressed with my feasting talents. I should have stopped, but what is a splendid meal without a proper dessert? 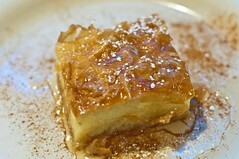 I had coffee and galaktoboureko. Semolina-based custard flavoured with lemon in phyllo, drizzled, and sprinkled with cinnamon with honey was enough to fly me to the moon. I think the patrons who were sitting next to me wanted me to stop humming, for I was exhibiting too much bliss. If you have some awesome food sitting before you and you are enjoying it, there is nothing wrong with letting it be known accordingly. 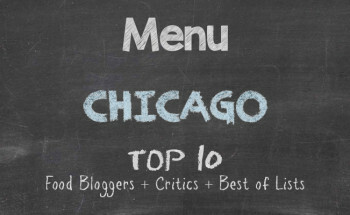 In 2012, I had the complete package of satisfaction: great service, outstanding food, and reasonable price. On this recent visit, the service I received from my server was top. The rest of the staff had a distant disposition that was kind of rattling. The food has not suffered as a result of the move, and the price is still sweet to the wallet. 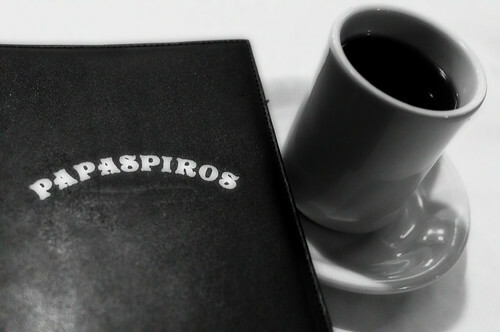 If Papaspiros draws crowds on Friday and Saturday nights the way I recalled during the stint at the former location, it may be a good idea to go during the afternoon on weekends. 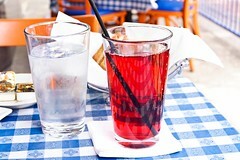 Certainly if the weather is pleasant enough for outdoor seating, take advantage of the restaurant’s authentic Greek menu items. Just don’t scream, “Opa!” The staff may think you’re ready to start throwing dishes on the ground. Yes indeed! And now that you mentioned Turkish, there are a few here in Chicago that I need to visit so that I can get them onto the blog.